Behind the persona of RODNEY CROMWELL is London based synth aficionado, Adam Cresswell. His debut long player ‘Age Of Anxiety’ was a concept album chronicling his problems with depression and anxiety that had affected his life and creative muse. It became an unexpected cult favourite in 2015, with a post-punk template echoing the spectre of acts such as SECTION 25 and NEW ORDER. However, Cresswell is a seasoned hand, having been part of synth duo ARTHUR & MARTHA with Alice Hubley. They released an album ‘Navigation’ in 2009 but disbanded a year later; Hubley went on to form the indie band COSINES while Cresswell took a musical break. 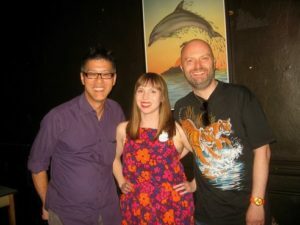 Several of the RODNEY CROMWELL songs began as ARTHUR & MARTHA recordings, so it was wholly appropriate that the pair reunited for RODNEY CROMWELL’s inaugural gig last summer. One of the highlights of the set was ‘Black Dog’, a pulsing part duet with Hubley embellished with the beauty of Cresswell’s Hooky bass. 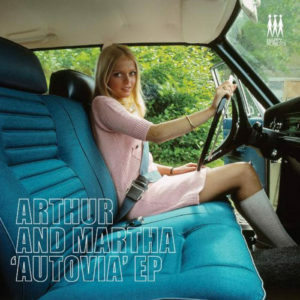 Performing together on several occasions since with guitarist Richard Salt, the band have even revived ‘Autovia’, a synthetically motorik soundtrack ideal for motorway journeys north of Watford Gap that was the key song on ARTHUR & MARTHA’s debut. 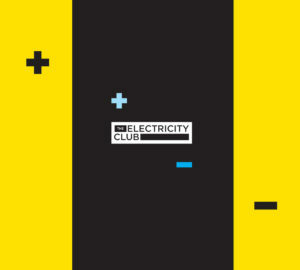 Both ‘Black Dog’ and ‘Autovia’ feature on the upcoming compilation ‘The Electricity Club’ released by Amour Records/EMI Monos/Universal Music, which also features ERASURE, OMD, SECTION 25, MARNIE, FOTONOVELA, MIRRORS and VILE ELECTRODES. With RODNEY CROMWELL’s upcoming appearance at TEC004 on SATURDAY 5TH NOVEMBER alongside MARSHEAUX and KID KASIO, both Adam Cresswell and Alice Hubley kindly chatted to TEC during a break in rehearsals. How does it feel to have not one but two songs on ‘The Electricity Club’ compilation? Alice: Ah, I’m in good company then… beat that Andy McCluskey! To be on an album with OMD and SECTION 25, those two bands particularly were such an influence when we were doing that ARTHUR & MARTHA album. I listened to ‘From The Hip’ all the way through earlier this week and that album meant so much to me at that time. Adam: I remember you bought that on vinyl from the States and it cost you fortune! 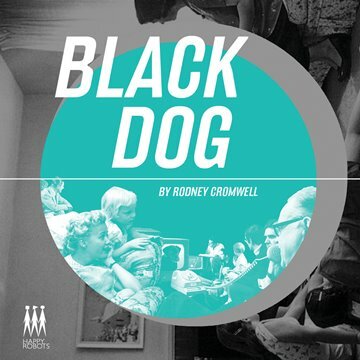 ‘Black Dog’ started as an ARTHUR & MARTHA track, is it the best song NEW ORDER never recorded? Adam: ‘Black Dog’ is knowingly NEW ORDER-ish anyway… it was about my safe space, it was about going through a bad period but wanting to be reminded of the music that made me feel good about things. Alice: I can’t remember recording the vocal! Adam: It was one of those one-take wonder jobs! Alice: I’m such a pro! But there so many records today that are over produced, having something that’s a little bit rough around the edges is kind of nice now. Adam: That’s why we like BATTERY OPERATED ORCHESTRA because they are a band that are not covered in loads of pitch correction and all that sort of stuff. The acclaim for ‘Age Of Anxiety’s means you’ve toured together as RODNEY CROMWELL, how have the dates you’ve played gone so far? Any strange occurrences you can report? Alice: You got to learn about the joys of JUSTIN BIEBER! Alice: It’s just been nice hanging out with Adam; we had not really seen each other since we stopped doing ARTHUR & MARTHA. Before when we toured, he only had a Smart car so we couldn’t take friends with us. Now he’s upgraded and has four seats in his car. Adam: The RODNEY CROMWELL gigs now feel much less pressured than with ARTHUR & MARTHA. How do you think the live environment has changed? Adam: I think it’s harder to get gigs now… maybe that’s because electronic music’s not as fashionable, because back in the mid-noughties, it was on the back of Electroclash and that hipster thing! Alice: We did lot of good shows in Shoreditch at the Old Blue Last and stuff in that electro scene alongside cool acts like LO-FI FNK and PLASTIC OPERATOR. 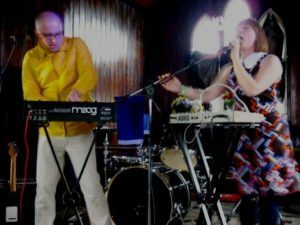 In the last year we’ve mostly played indie scene events, we’ve not really had the chance to play with other synth bands. What advice would you give to anyone aspiring to use vintage synths live in the 21st century? Alice: I have a Korg MS10 and a Roland Juno 60… we used to use MicroKorgs in ARTHUR & MARTHA, but I look at them and shudder! I can’t deal with them anymore! Adam: When we did ARTHUR & MARTHA, we were rocking up with the Moog and a MicroKorg because it was more convenient. But other every other band seemed to be using MicroKorgs too, but just the presets! I hate it! I wiped all the sounds! Adam: We would upgrade if we ever did ARTHUR & MARTHA again. So how do you perform ‘Autovia’ in RODNEY CROMWELL now? Adam: Oh, we do it totally differently because Alice used to play the clarinet while I played the Moog. But now we’ve dropped the clarinet and we do it with MS10, Moog and guitar to give it that added HARMONIA feel. Alice: It’s a bit more of a synth jam, more droney… I like to make the most awful sound I can on the MS10 which is always a lot of fun. Adam: It’s become our experimental track in this live set. For the last 2-3 minutes of that song, we just wig out! Sort of like STEREOLAB meets NEU! ? Alice: I really like it when bands do that, like HOT CHIP always reinvent their songs…they’ll still be playing ‘Boy From School’ but they’ll do it in a different kind of feel every time you go and see them. Adam: With RODNEY CROMWELL as opposed to ARTHUR & MARTHA, we’ve tried to bring something of the live band back to the sound, it’s about us enjoying it. Using analogue synths and a load of effects pedals brings in all these variables, things wobbling in and out. Who came up with ‘Autovia’? Adam: That was me! I was on tour with my previous band SALOON in Spain and I saw the word ‘Autovia’ on the road; it sounded a bit like ‘Autobahn’ and so I wrote a song called that. Most of it was recorded in the downstairs toilet of my house! I did the first half of it with SALOON and it was going to be a B-side to a single that never happened, so I took it to ARTHUR & MARTHA. The ex-SALOON members call it my ‘Ceremony’, in that it’s a song I took from one band into the next. It was just a 4 minute ploddy pop song, but Alice came along and added the last three minutes to it with the clarinet and it mutated into something more epic. How did Alice end up singing on it? Alice: I just like singing, I was listening to a lot of OMD, SECTION 25 and SAINT ETIENNE… originally, I was meant to join SALOON…we met when we were 12 when our bands at the time were on the same bill! My band were called THE SEVEN INCHES! We kept in touch and was moving to London but SALOON broke up before I moved. So me and Adam talked about doing a two-piece, Adam had more of a bank of songs ready and ‘Autovia’ was in the first set we did live. Adam: She connected with the song straightaway. Alice: Adam didn’t really sing much initially. ‘Kasparov’ on ‘Navigation’ was the first song Adam did sing, I kind of had to talk him into it, partly because he made it sound more like THE POSTAL SERVICE. He was always in the background with SALOON even though he wrote a lot of the songs. What’s next for each of you with your various projects? Adam: There’s a new RODNEY CROMWELL single ‘Fax Message Breakup’ which has some really cool remixes on it by HOLOGRAM TEEN, CHRIS FRAIN, AUW and THE LEAF LIBRARY. We’re doing a London warm-up gig before TEC004 with BATTERY OPERATED ORCHESTRA and RÉMI PARSON. And next year will see if I can actually write another album. Alice: COSINES have just released an EP called ‘Transitions’ and are finishing the second album. If you like RODNEY CROMWELL and ARTHUR & MARTHA, you may like COSINES… it’s guitary but there’s still a lot of synthesizers and keyboards on it. I think with the new album, we’re experimenting with new sounds and doing things a bit differently. The scene COSINES play in is a lot more guitar based and a lot of it is people that I’ve known for the last 15-20 years. 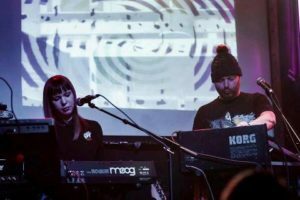 I don’t really know enough about the electronic music scene at the underground level, but everyone I’ve met has been very nice and whenever we play gigs, I get people coming up to me and saying nice things about ARTHUR & MARTHA. Is an ARTHUR & MARTHA release possible? Alice: Every so often, Adam tries to get me to do something, I don’t know… never say never!